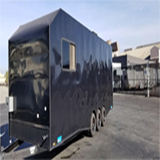 Specialized in providing Mobile Dishwashing Trailers during renovation, construction, expansion, emergencies and special events. Available nationwide. We are the #1 one service provider for mobile dishwashing trailer in all US including all major cities, offering ADA compliant ramp and assistance in obtaining your health permit. 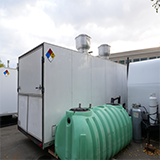 Our portable dishwashing trailer rental meets the needs of hospitals, schools, nursing home restaurants and many other companies. Your portable dishwashing facility is now within your reach. We offer rush deployment to all 50 states. To address restroom facility needs, we also provide restroom rental in all over United States. Our trailers ranges from 20 ft to 40 ft in length. We have stalls available for women, male and handicap. Aside from this, we also have a locker room, shower, living, other combinations of restrooms and support facilities. These trailers are especially maintained to be clean at all times to make sure we provide you only the best experience. Our mobile kitchen services is ready to be brought to your location for any of your commercial kitchen renovation, remodelling or relocation. It comes with 3- compartment sinks, hand sinks, Ansul fire suppression systems and a lot more. 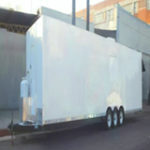 Our mobile kitchen trailers have diamond plate flooring and white washable walls. Designed to pass health inspection code in all 50 states, all fully versatile and operated on propane, electricity or natural gas. Our Ramps are both ADA compliant and OSHA approved. 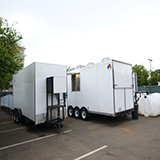 To maximize the benefits of our mobile dishwashing trailer and temporary kitchens, we offer you our ramp rentals which eases the transportation of food carts from one trailer to another. The staff need not to go to the ground to jump into another trailer. They just have to walk through our ramps, push their carts and they are directed straight to another trailer. For any business that needs extra refrigeration, we offer both mobile refrigerated trailer and containers to suit your industry-specific needs. Trailers that run on a single-phase power requirement and refrigerated containers that are more suitable for long-term rentals best for those requiring a much larger room capacity. Comes in an adjustable temperature setting (15 C to 60 C) with a keyless digital dial pad security feature for convenience. We offer Dining Hall Tents for your large-volume trailer renting specification. It has a metal and fabric open span structures for semi permanent dining hall experience, designed to conform to the principle of utilization able withstand strong winds, snowstorms, seismic activity and the likes that can last for more than 180 days in tough weather conditions. solution for wash, rinse and sanitize. The most versatile trailer with 22 ft Long and 8ft wide making it easy to fit in most locations. Runs with both propane and electricity with minimal power requiements for as low as 220V, Single phase 80 amps. A mobile dish washing trailer that is 38 ft long by 8 ft wide, combining electric and propane to give comfort in making your meals, your hired chef would love this kind of set up. You don't have a 3-phase power? don't worry this dishwashing trailer conveyor type is for you. Recommended by many for large-scale dishwashing operations, such as adding rinse cycle to dry your dishes fast. A 40 ft by 8 ft wide all electric conveyor type for a 3-phase power comes with Bay and Handwashing Sinks, Soil Tray, Wirewracks, Low Temperature Push Thru Dishwasher and Hobart Conveyor Dishwasher. Copyright 2019 www.portable-dishwashing-trailer-rental.com | All rights reserved.